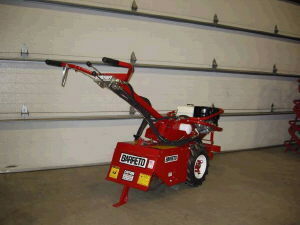 USED TO TURN THE SOIL OVER FOR PLANTING OF LAWN OR GARDEN. HAVE YOU REMOVED ALL OF THE WEEDS OR GRASS? DO YOU NEED A SODCUTTER FIRST? LANDSCAPE RAKE, LAWN ROLLER OR WHEELBARROW NEEDED? Being self-propelled, the wheels and tines work independently of each other. The tines may be reversed for harder soil. 27" WIDE x 77" LONG x 44" HIGH 560 LBS. TINE WIDTH = 20"